One of the beautiful things about being in digital marketing is that if you have a question, there is data out there somewhere that can give you a clear answer. Lately, we have been thinking about our friends and clients in the auto/car dealer space and how they are approaching marketing. In a previous blog, I went on a rant about why brands need to be investing more dollars in digital marketing. In this blog, I am taking aim at car dealers specifically to help them understand the buying process of the modern car buyer and realize that there is a lot of activity beyond the borders of the dealership. Below is a graphic with quick takeaways from some studies we dug into, however just below that is a little more context. There is a TON of research (almost two full workdays worth) being done online. The modern car buyer wants to be in control of the process and tries to educate themselves as much as possible on the different makes, models and features available. Car dealers that aren’t offering up valuable content to help with this research are making a big mistake. Why wouldn’t you invest to make your dealership the go-to source for content that helps the buyer decide? All that online research distills down into roughly 5 hours in the dealership. This data point doesn’t consider customers who want to negotiate or walk away from a sale. However, the main takeaway here is that buyers are spending way more time AWAY from the dealership when trying to decide on a purchase. Having customers on the lot browsing is great, but what about those who aren’t there in person? Statistically, the modern car buyer spends a lot of time online arming themselves with information and when they are ready to buy it takes just one visit to a dealership. You can also read this as the first dealer they visit is the one they usually buy from. How can car dealerships set themselves up for success? Create a digital breadcrumb trail of great content (and advertising) that makes your dealership top of mind for when they are ready to buy. If they chose your competitor, the data says they will buy from them. Now, since we have mentioned the research, time spent in the dealership and that they buy from the first dealer they visit, let’s take about influences. 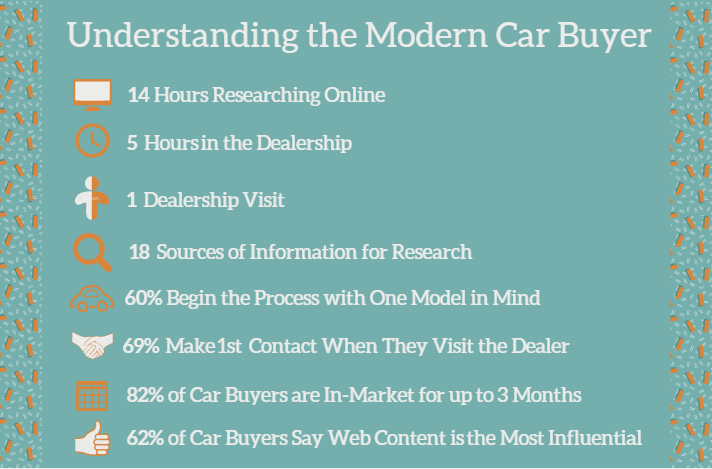 The modern car buyer leverages an average of 18 various sources of information when making a buying decision. Is your dealership spending all its budget on TV and radio ads? What about the 16 other sources of info available? You just lost that business to a competitor with a diversified approach. While traditional advertising is important, we highly recommend allocating appropriate budget to ongoing content creation, search engine optimization and social media marketing. People looking for cars usually start via a search engine. It’s up to dealers to invest in the creation, optimization and targeted distribution of the information car buyers use. Otherwise you’re throwing dollars at traditional marketing channels and hoping for the best! Take control! The modern car buyer begins their search with something special in mind. They have specific wants and needs; however, they can be upsold with the right content. The more model specific content your site can have, the better. This will allow you to be more discoverable for users who start there buying journey looking for something specific. I love this stat. A huge majority of car buyers never interact with your dealership until they are ready to buy. Imagine that! Unless you are putting touch points out there by way of content, the moment they walk on the lot is the first time your dealership knows that specific buyer even exists. We should wonder if putting contact forms on dealer websites WITHOUT offering valuable content is a smart strategy. We recommend offering buyers value in return for their contact information so you can try to initiate contact prior to their visit to your dealership. The car buying process can take up to 3 months, however most dealerships seem to have a month over month view of success. A commitment to an “always on” content strategy will ensure that your dealership is hitting the right buyers with the right content at the right time during their journey. We have to shift from pops in activity to a more constant, strategic effort. When we take a step back and look at what kinds of content really help push shoppers into a buying decision, we see that online content is the most influential. Blogs, videos, social media posts and other content is what is resonating with the modern car buyer. If you are neglecting this aspect of your marketing plan, you risk losing customers to your cross-town rival who is reading this blog right now. 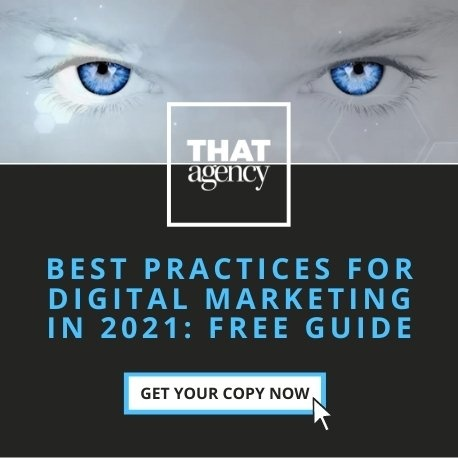 Its time to take your digital content strategy seriously! want to learn more about Inbound Marketing and the Automotive Industry? Download our new report!